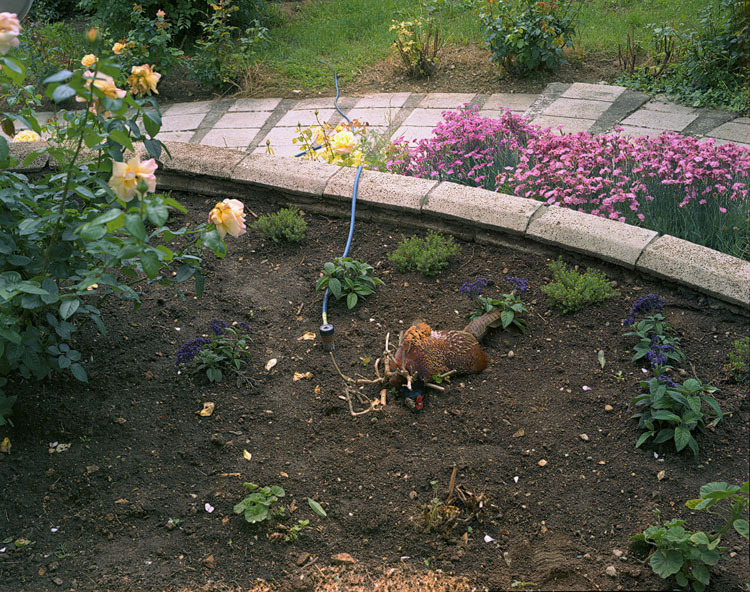 fototazo: The Image: Benjamin Donaldson, "Pheasant, Csopak, Hungary 2006"
The Image: Benjamin Donaldson, "Pheasant, Csopak, Hungary 2006"
My three weeks spent in Hungary on an artist residency are now rendered mostly as sound clips in my imagination. My pictures become associated with these sounds. The muffled sounds of a ragged, distant Harley-Davidson rally on Lake Balaton is something I can still hear. It's a few miles distant - two-wheeled Magyars in leather vests riding mechanical bulls while they bellow in the high lake winds. The echoes climb through the vineyard hills, over the red-tiled farm house roofs and in through my window while I try not to sleep. These sounds become magical incantations in a strange place. I also can conjure up the sound of new words - a new friend telling me the word for "wizard" in Hungarian- "varázsló." It finally sounded to me as the thing it describes. Mostly I recall the constant thunder that signaled another day spent wet. The audible and physical sensations of these things were never meant to be forced into the frame of a photograph, but I strangely persist. If I listen with my memory tuned to the time the image was recorded, the other two sounds that I can recall with most clarity are the pheasant colliding with the residency house and the sound of my own narrative while I photograph (it always works the same way). Insistent, my imagination fixates upon a phrase or piece of music, and plays it on repeat, until I must sing it softly - quietly enough for me to hear it aloud so I may turn it over and consider its meaning, as if taking a sacred thing from the dark to be seen in the light of day. I must be alone for this to start in the way it seems it must. When this reverie begins, I am ready for work. When the rain wasn't torrential, I would unfold my 8x10 camera from its bag and crown it upon the tripod, then it would be balanced upon my shoulder. The dark cloth that helps me block the light of the world from everywhere but that which comes from the lens over my shoulder first, as the weight of the thing grows with the measure of the day. I wander in this new place at the center of Europe. I know the history of the place; it is my way of understanding things - to look at what it was. Sometimes there are layers of what I wish to do with the pictures based on this. I attempt to build them together to spin the fiber of the whole, strand by picture strand. Sometimes I try to be taken by what I see, open to the way things simply go together or don't. Sometimes the idea is first, then the construction. I am of two minds. "Make it or take it" as someone once described this process to me. I am in the between place. The world must render up to me what I look for. I wander, and mostly the world refuses to combine its parts into something I can flatten into these pictures. I spend days walking, carrying my camera, and looking. The things I need to picture rarely materialize from their ordinary surfaces, nor can I wrestle them from that liminal place. As the day arcs, I grow tired and distracted. Then music or a phrase presents itself, usually only a snippet. I consider it, and try to have it guide me as I look for what a picture could be. It's the subconscious element that makes the process personal to me. I need to feel that my state of mind is ready for the work. I never listen to music or a person reciting something while I walk; it has to come from some forgotten place in my imagination. For these three weeks, the 1980's new-wave song called "Brighter" has lots of airplay from my internal DJ. A single line from the song (which I change slightly in my mis-remembering) revolves to the point I have to repeat it as I work - "What matters? What really doesn't matter? It all becomes so vague." A bit of a throw-away line, but it gets to the point. The mantra is necessary and unnecessary, just as the meaning is. Everything seems to balance upon this precipice. I make my way home through the middle European back yards in twilight, dogs trailing. The sound the pheasant made when it hit the side of the house the next morning was distinct and new in the rustic house. It was sudden violence. It was loud and sharp enough to imagine the breaking of fragile bones when it shocked us all from early morning sleep. The huddles formed outside the rooms, everyone wanting to know what their ears had just told them. Annette (the Hungarian woman that ran the household) called to us from the dark bar at the front of the residency. We all trailed outside to the front garden in pajamas and confusion. Just outside the door, the pheasant was almost invisible, as it was just as colorful as the spring-full garden bed. A beautiful bird flies at a house in the early morning light and breaks its neck. We all crowd upon it, knowing this is something to decode.